Watch a video about DesignFest 2018. MICA Grassroots DesignFest, sponsored by the T. Rowe Price Foundation, is an amazing opportunity to contribute to the social change movement in Baltimore while collaborating face-to-face with other designers and nonprofits. 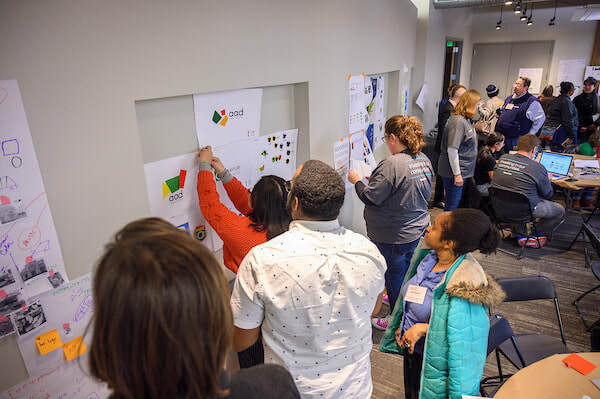 Teams of volunteer designers work with grassroots nonprofits to prototype logo designs, website updates, branding strategies, and more - all in one jam-packed daylong event. Why should I participate in DesignFest? MICA Grassroots DesignFest nonprofit participants are all grantees of the T. Rowe Price Foundation and work on issue areas including arts & culture, education, human services, and the environment. Through a competitive application, projects were screened for appropriate scope. Each nonprofit will have key stakeholders at the event to collaborate with designers. ​Please note: at this time, we are no longer accepting applications for nonprofit participants. Design teams are uniquely diverse. They are made up of graduate and undergraduate students, design professionals, and Baltimore City high school students who are art school bound. Each design team will be carefully assembled based on participants' skills and preferences. At MICA Grassroots DesignFest, seasoned design coaches are on hand to offer guidance. A list of designer participants will be shared with Impact Hub and other partners looking for leads on mission-driver designers, and participating designers will be promoted through MICA and the T. Rowe Price Foundation's outlets. ​Please note: DesignFest 2019 has come to a close, but please sign up here to get updates on future events. Nonprofits submit their design challenge. Designers volunteer their time and talents. Design teams are assembled and introduced to their nonprofit partners ahead of MICA Grassroots DesignFest. Everyone comes together and the creative process unfolds, supported by lots of coffee, plenty of good food, some great design coaches, and YOU!